Here are some easy baked bean recipes. Some are quite quick if you pre-cook the beans, or use beans from a can. Dried beans are generally cheaper than tinned ones but you need to factor in cooking time and cost. You can try this first baked bean recipe with a variety of beans but haricot are the kind which will deliver something which is close to those baked beans you can buy in tins. This first dish can be cooked on the top of the stove, in a Dutch oven or casserole dish or in a slow cooker. I would think you could also cook it in a pressure cooker - but I haven't tried that. Note: If you do use a slow cooker, it is important to pre-cook the beans as some varieties contain toxins which are removed by boiling. First soak and cook your beans. They are best soaked over night and then cooked for an hour or so with a little salt and plenty of water. If you need faster results, soak them in boiling water and pre-cook them for ten minutes, then let them stand. They should then be ready to cook in about an hour. I find this is the easiest approach because then you do not need to be so exact with measurements of water added. When the beans are well-cooked, drain them. Mix everything together thoroughly. Let everything cook slowly on a low heat. After about half an hour or so the baked bean recipe is ready to eat. Serve with salad, savoury pancakes, rice or even bread and butter. 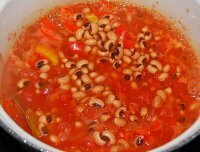 You can make this baked bean recipe up with black eyed peas or with any common beans. You can also add a dash of chili pepper or ring the changes with different spices. As noted earlier, if you want something like the taste of tinned baked beans, go for haricot beans as a base. Classic baked beans should perhaps rather be called stewed beans - as they are cooked slowly in a thick sauce. That's it, really! Ring the changes with different beans and different vegetables. Read on for cassoulet - a French classic. More Easy Beans: Quick and tasty bean, pea and lentil recipes is a great source of baked bean recipes and other legume delights! The recipes really are easy and delicious. Highly recommended. If you would like to add your own recipe to these easy baked bean recipes please use this simple box below. Vegan and low-meat recipes are especially welcome. Thank you! Read on for more baked bean recipes. Baked bean recipes would not be complete without a kind of cassoulet. Cassoulet is a fabulous dish from France. It is often given as quite complicated with lots of processes. Here is a relatively simple version which you can make on the stove top or in the oven. It's also suited to cooking in a slow cooker. It provides a hearty, rich meal which needs little to accompany it - maybe fresh salad or a little rice. Serve it in bowls with a hunk of bread like a thick soup. The consistency should be thick and and the liquid should be bursting with flavour. In France it is generally finished with breadcrumbs toasted on top in the oven. The quantities of ingredients are quite flexible and you should also be able to make a vegan version with quorn or another non-meat protein source such as TVP. Soak and cook about a pound of beans. You can use different varieties here. 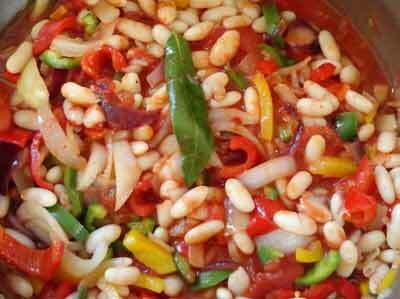 It's nice with black eyed peas, chickpeas or canellini beans and haricot beans suit well too. You could even make it with a mixture of beans. You can of course, use beans from a tin. Once the beans are cooked, refresh them in clean water to remove any scum. Add a little more water, the herbs, cloves, garlic cloves and a large onion and continue cooking for about 15 minutes. You can add the cloves to the onion by sticking them straight into the flesh. This is quite handy if you are sensitive to the flavour of cloves and don't want too much of a good thing! You can just take them out of the flesh before the onion disintegrates. Now add the chopped carrots and other vegetables and then the pre-cooked meat, which is easier to manage if it is also chopped up into manageable sizes. Add the chopped tomatoes and tomato puree and bay leaf. A splash of wine is also a good thing to add. Choose red or white, depending upon the meat. Cider vinegar in small amounts also can help the flavour. Serve this easy cassoulet with hunks of bread or even with rice or potatoes.